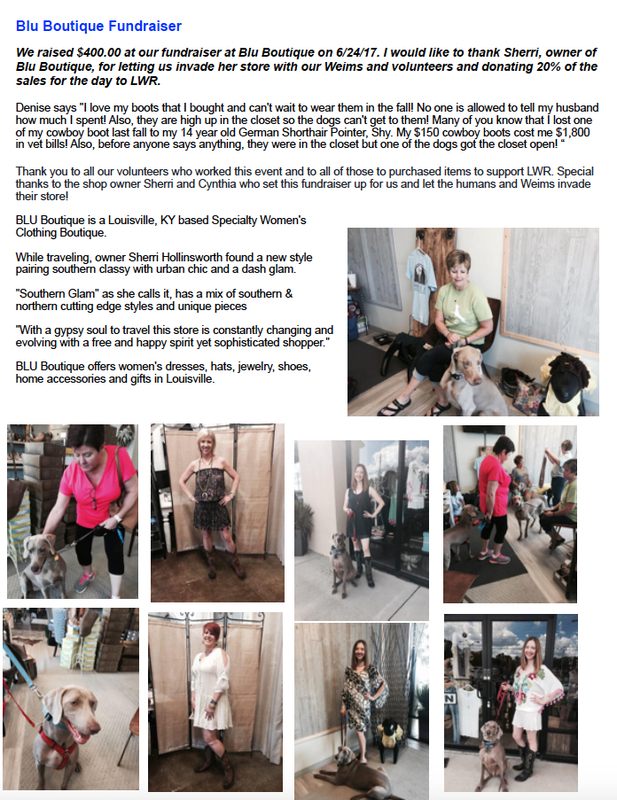 ABOUT THE BREED | Louisville Weimaraner Rescue Inc. The Weimaraner breed is several centuries old. It is derived from the same selective stock as other German hunting breeds, and is a descendant of the Bloodhound. The Weimaraner is a good, all-around hunting dog and an excellent pointer. Weimaraners were originally used for the hunting of bear, deer and wolves. Today they excel as bird dogs, mainly upland game birds, and even are used for water retrieving. A Weimaraner first appeared in a Van Dyck painting from the early 1600s. Howard Knight, founder of the first American Weimaraner breed club, imported the dogs to the United States in 1929. The Weimaraner was first recognized by the AKC in 1943. The popular children’s TV show, Sesame Street, features skits with Weimaraners dressed up in human clothes. Some of the Weimaraners talents include: hunting, tracking, retrieving, pointing, watchdog, service dog, search and rescue, and agility. The Weimaraner is a medium-to-large, gray dog with short hair that was bred for hunting. The height at the shoulder for males is 25 to 27 inches; females 23 to 25 inches. Males weigh 70 to 85 pounds, and females 55 to 65 pounds. The tail is docked to an approximate 6″ length. The head is moderately long and aristocratic; ears are long and lobular. The eyes range from light amber to gray or blue gray. The standard coloring is a silver gray, but the blue Weimaraner is charcoal gray. Occasionally you will see a long-haired, gray Weim. The Weimaraner should present a picture of grace, speed, stamina, alertness and balance. The Weimaraner is happy, friendly, intelligent, fearless, alert, and affectionate. It is good with children, though this can vary by individual. Weimaraners are known for their high activity levels. Without proper exercise, it can be very rambunctious and difficult to control. This hunting dog has a strong prey instinct and should not be trusted with small, non-canines such as hamsters, rabbits, chickens, and guinea pigs. It should be socialized well with people, places, things and other animals. Weimaraners absolutely crave leadership. They want to know what is expected of them and for how long. Owners should not be harsh with a Weimaraner, but lead with a calm, natural air of authority. Weimaraners want to be with their people and be involved in their activities. Weimaraners cannot be continually housed in a kennel, the backyard, or the basement. They are “people dogs.” To have a Weimaraner is to have a second shadow. They insist on being with you as much as possible. This is NO exaggeration. While they do not possess the aggressive personality of a guard dog, they will protect their property and let you know when a stranger is approaching their territory. Weimaraners need lots of exercise. A couple of leash walks each day will not meet their needs until they are into their senior years. They were bred to have great stamina and speed to hunt all day. They are great companions for the active individual or family. An occasional bath (usually no more than once a month), coat brushing, trimming of nails, and cleaning of ears and teeth are all that is required. Hip dysplasia is an occasional problem, especially with breeding stock that has not been x-rayed and received a passing rating from the OFA (Orthopedic Foundation for Animals). Bloat (an accumulation of excess gases in the stomach) and gastric torsion (twisting of the stomach) is a leading cause of death. Most other health problems are in the realm of accidents, including swallowing foreign objects. This breed learns quickly, but will get bored if the training is repetitive. Weimaraners grow to adult size very quickly, and training helps to channel their enthusiasm and energy properly. While they are very intelligent, their attention span is short, especially when they are puppies. This breed needs training starting at puppyhood with an owner who treats them firmly, fairly, and positively. Harsh training has no place with this breed. Training is most successful when it is done in short sessions, firmly, consistently, and with a gentle hand. Despite their size and strength, Weimaraners are sensitive. Heavy corrections will have an adverse impact on the dog’s learning and demeanor.